The works presented here are all FROM THE STUDIO and are as you see them pictured here. They are all Giclees' or Fine Art Prints. All are printed with Archival Inks, some on 140# textured watercolor paper, some on gallery wrap canvas, some are framed, others are matted and in some cases, just the Giclee' is available. Only the finest materials have been used. Free pick up at my STUDIO if you live near Santa Cruz. Otherwise, shipping and materials for shipping will be added. Please contact me directly for payment through PayPal or to mail me a check. 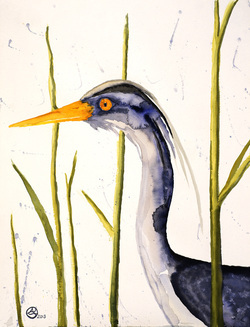 A departure from what I thought was my STYLE, the Blue Heron in the Reeds is a wonderful portrait of this fabulous bird. There are several available sizes and options of this design. 1.) FRAMED 18" X 24" DOUBLE matted Giclee' on 140# Watercolor Paper with a deep blue inner mat and off white outer mat (picture to follow) and FRAMED in a Driftwood Frame. Outside dimension of frame is 24 3/4" X 30 3/4". Width of frame is 1.5"; depth is 1/2". $325.00. 2.) Giclee' 18" X 24" on 140# Watercolor Paper NO Matting $75.00. This comes with a rigid backing and in a plastic sleeve. This reflection is very stunning on the wall. This was printed on canvas using archival inks with a matte finish. The Gallery Wrap frame is 1.5" and very sturdy. Comes with hanging hardware on the back. This Giclee' is double matted with the inner mat being a deep teal blue green which forms a delicate inner line around the print. Outside of frame is 16 5/8" x 19 1/2". 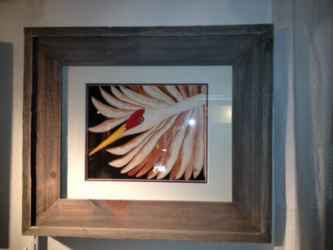 Art work/inner mat is 13 5/8" X 16 1/2"
Frame is like driftwood or barn wood and is 1 1/2" deep, very substantial. $165.00 for the piece you see here. This Giclee' is double matted with the inner mat being a dark tan which forms a delicate inner line around the print. Outside of frame is 16 5/8" x 19 1/2". Art work/inner mat is 13 5/8" X 16 1/2"
$165.00 for the finished piece you see here. This Giclee' is double matted with the inner mat being a deep chocolate brown which forms a delicate inner line around the print. 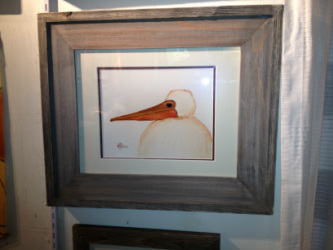 Frame is like driftwood or barn wood and is 3" wide and 1 1/2" deep, very substantial. This Giclee' has a deckled edge and is mounted on top of the off-white mat. Outside of frame is 15 1/2" X 12 3/4". 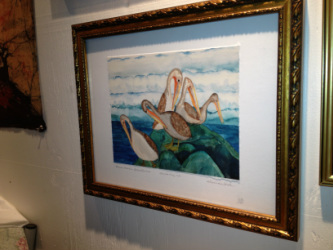 Art work is 9 1/2" X 7 1/2"
Frame is gilded wood and is quite decorative. $125.00 for the piece you see here. 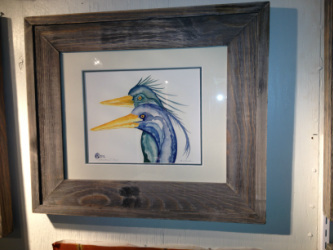 These whimsical Blue Herons depart from my usual style. I was playing around and voila', this design was born. 1.) FRAMED 18" X 24" Giclee' on 140# Watercolor Paper is single matted in a deep blue (picture to follow) and FRAMED in a Driftwood Frame. Outside dimension of frame is 24 3/4" X 30 3/4". Width of frame is 1.5"; depth is 1/2". $325.00.